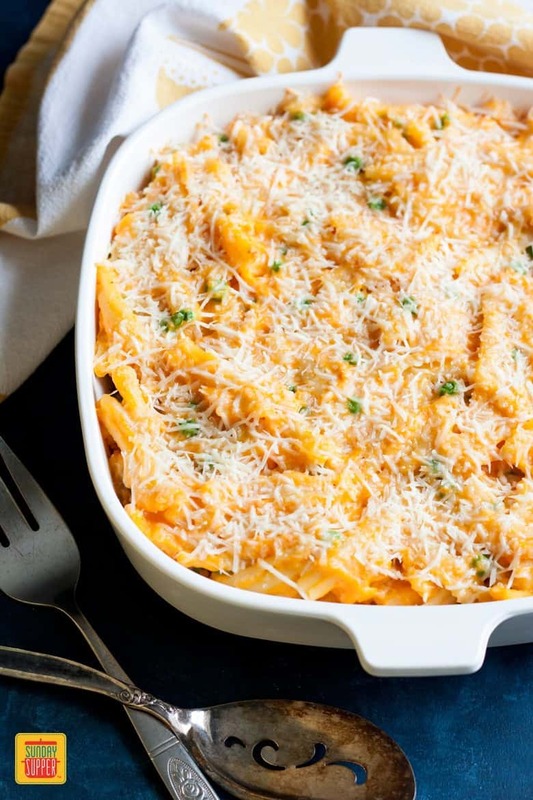 This Sweet Potato Mac and Cheese Casserole recipe is so easy to make and will make all the sweet potato lovers drool. It is a meatless casserole that can stand on its own as a meal but can also be the perfect side dish to serve up at dinner. Gone are the days when mac and cheese comes from a package with powdered cheese mix. Today, we eat gourmet mac and cheese in all different forms and shapes. There are restaurants dedicated to serving just mac ’n cheese. 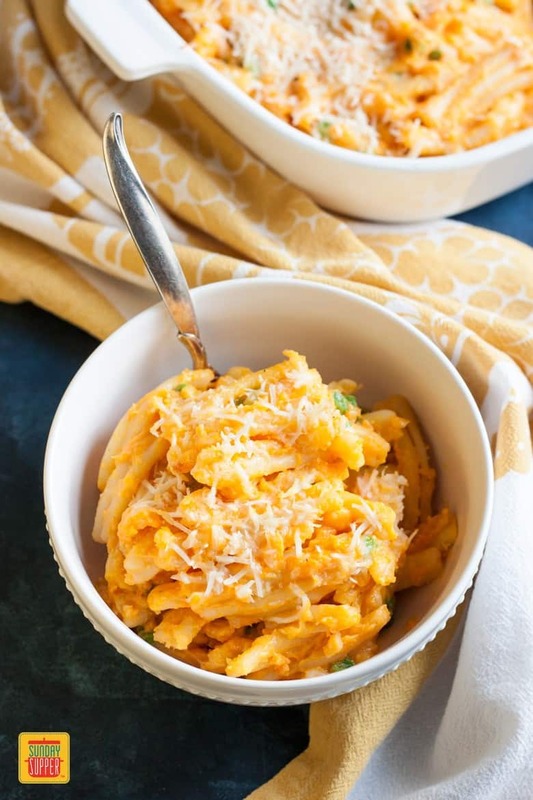 But with just a few different ingredients, you can serve up an interesting and delicious Sweet Potato Mac and Cheese Casserole right at home. This meatless casserole is also the perfect meal for the upcoming Lent season. Or you can serve it up as a side dish anytime of the year. Microwaving the sweet potato will cut down your prep time by a lot. A whole large sweet potato can take up to 2 hours in the oven to cook through. Any type of small pasta will work well in this recipe. You can use sharp cheddar, mild cheddar or white cheddar cheese depending on your preference. I used a mixture of all three. I use whole milk in this recipe but if you want to stay on the healthier side, you could substitute reduced fat milk. Any other small frozen vegetables will also work well in this recipe like frozen mix vegetables for example. But I specifically like frozen sweet peas since it goes well with sweet potato. 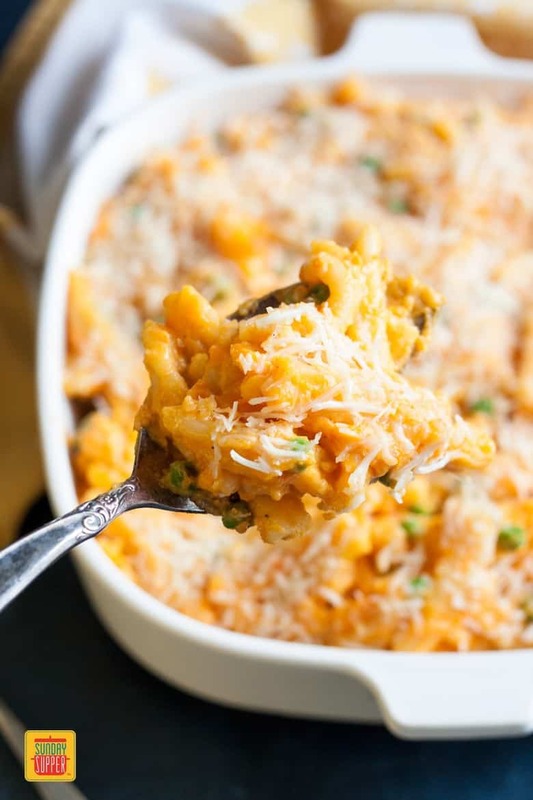 I love sweet potato, so adding it to this Sweet Potato Mac and Cheese Casserole was a no brainer. Not only does it make a delicious sweet and savory dish, it is a good source of vitamins and minerals. So eat up, because it is good and good for you! Wash the sweet potato and pierce with a pairing knife a few times. Wrap it in plastic and microwave for 8-10 minutes until tender. Check by poking it with a knife or fork, if it goes through easily, the potato is done. Scoop out the flesh and add to a food processor or a blender with a splash of milk. Puree until smooth and set aside. Cook pasta according to directions on the package. Add the peas into the boiling water during the last two minutes. Remove from heat, drain and set aside. In a medium sauce pan, melt butter over medium heat, slowly sprinkle flour over the melted butter while whisking continuously until a roux forms. Increase heat to high and slowly stream the milk into the roux while whisking continuously. Continue to whisk the mixture until the sauce thickens. Add the pureed sweet potato to the sauce and stir until thoroughly combined. Turn the heat off and slowly add the cheddar cheese, whisking until the cheese is fully melted. Add salt and pepper to taste. 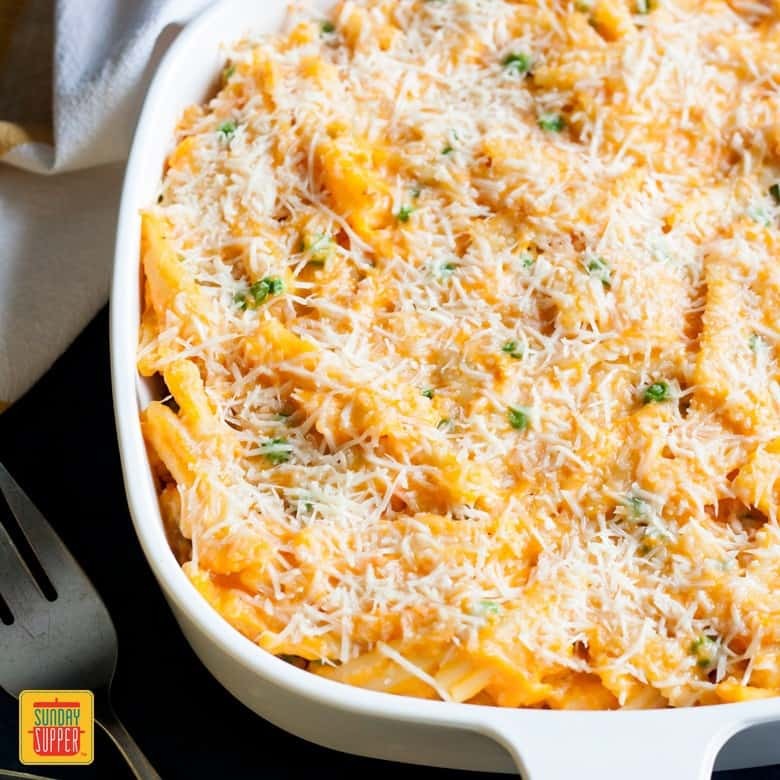 Mix pasta and peas with all the sauce and add to a 9”x13” baking pan. Sprinkle Parmesan cheese on top and bake for 10 minutes. Remove from the oven and let cool 5 minutes before digging in. 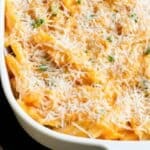 This recipe was adapted from Momma’s Meals Vegetable Mac N Cheese Casserole.